In 1871 and 1872 territorial senator Seth Bullock was helping to create Yellowstone National Park. In 1873, he was serving as sheriff of Lewis and Clark County, Montana. In 1876, he and Solomon "Sol" Star opened a hardware store in the notorious Deadwood, South Dakota, banking on lucrative business in that gold rush town. At the time, Deadwood was a rowdy, lawless mining town. In fact, Wild Bill Hickok was shot the day after Seth Bullock opened his hardware store, the "Office of Star and Bullock, Auctioneers and Commission Merchants." With business interests in Deadwood, Seth Bullock responded to a call for enhanced law enforcement in town and accepted a position as the town's sheriff. His tenure established a semblance of stability in the wild and wide-open Deadwood. Bullock brought his wife and daughter to town and bought a ranch at the junction of the Redwater Creek and the Belle Fourche River. 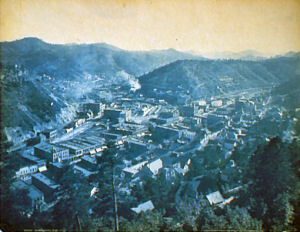 When their hardware store burned down in 1894, Bullock and Star built Deadwood's first hotel where the store had stood. A good friend of Theodore Roosevelt, Bullock, earned the rank of captain in the Rough Riders. On November 2, 1889, South Dakota attained statehood and Seth Bullock was appointed to the position of U.S. Marshall. Former territorial senator, sheriff, hardware store owner, and Roosevelt Rough Rider, U.S. Marshall Seth Bullock approached State Senator Ernest May, of Deadwood, about a State flag. Senator May consulted with the Secretary of the State Historical Society, Doane Robinson. "The Flag of South Dakota shall consist of a field of blue, one and two-thirds as long as it is wide, in the center of which shall be a blazing sun in gold, two-fifths as wide in diameter as the width of the flag. Above this sun shall be arranged in the arc of the circle, in gold letters, the words 'South Dakota' and below this sun in the arc of the circle shall be arranged the words in gold letters, 'The Sunshine State', and on the reverse of the blazing sun shall be printed in dark blue the Great Seal of the State Of South Dakota. The edges of the flag shall be trimmed with a fringe of gold, to be in proportion to the width of the flag. The staff shall be surmounted by a spearhead to which shall be attached cord and tassels of suitable length and size." This official flag, displaying on the obverse side the "blazing sun in gold" and the Great Seal of the State of South Dakota on the reverse flew over the Sunshine State for many years. Unfortunately, a flag with a different design on each side was more expensive to produce than a flag with the same design on each side and, as the price tag rose, fewer and fewer flags were in evidence in the state. In the South Dakota legislative session of 1966, legislation approved February 3 created a revolving fund known as the "Special State Flag Account" in the office of the State Treasurer. The law also required the Bureau of Administration "to keep on hand at all times a sufficient quantity of the South Dakota state flags as specified in § 1-6-4, for distribution, loan, or sale, as it may determine, in order to meet the demand therefore from various public, semipublic and private organizations or persons." Long promoted as "The Sunshine State" because of the multitude of sunny days that graced South Dakota each year, the legislature ceded "The Sunshine State" to Florida and adopted a nickname that would forever remain unique. The following information was excerpted from the South Dakota Code , Title 1, Chapter 4. Source: SL 1987, ch 4, §§ 1, 2. Source: South Dakota Legislature, South Dakota Codified Laws, , Nvember 7, 2007. Source: South Dakota Historical Society, Unit 7 Notable South Dakotans, 1900-1950, , November 7, 2007. Source: Wi-iyohi , Volume II, November 1, 1948, The South Dakota Historial Society, 1948. Source: South Dakota Bureau of Administration, History of the South Dakota State Flag, , November 7, 2007. 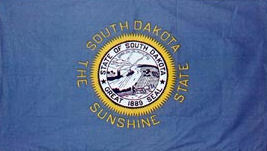 South Dakota (U.S.): FOTW "Flags of the World" Web Site.